A Blogsite is an advanced WordPress theme that includes features of a flash site such as the galleries, contact page, calendar, and proofing. Our Blogsites are built upon WordPress and require a NEW BLANK WordPress blog for us to install it on. If you order a Blogsite service we will install and configure WordPress for you. If you purchase the Blogsite as an owned license to host on your server a BLANK NEW WordPress installation will need to be pre-installed or we can do this for a $50 fee. Most server companies have an easy install for WordPress through their control panel. 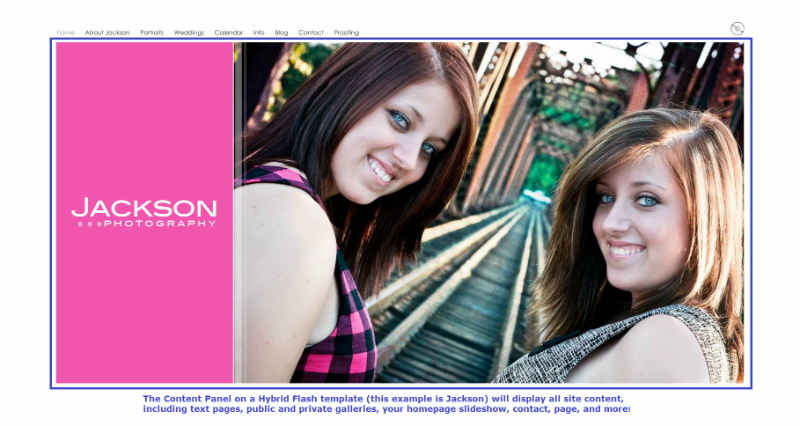 Content on Blogsites is added via BOTH the sitezadmin (as with the Flash Templates) as well as via the WordPress admin. 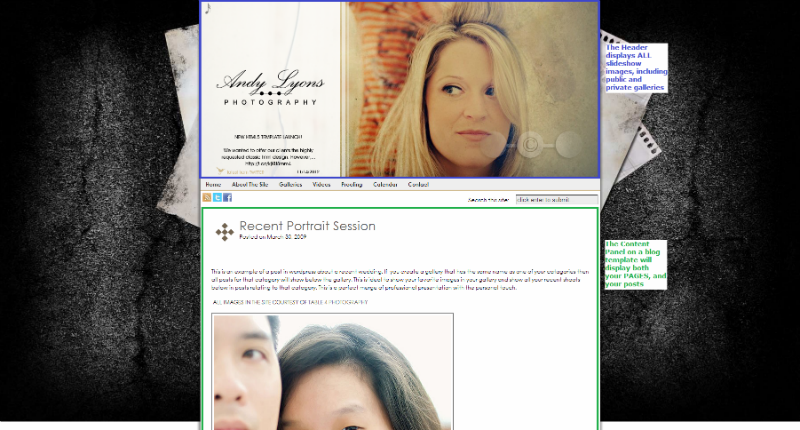 On Blogsites, all slideshow, public gallery, and proofing gallery (proofing galleries are only available at the Premium service level) images are displayed in a portion of the site, at the top of the window, called the Header. With the exception of the Contact and Calendar pages, the "text pages" of the site are all displayed vertically, where the visitor has to scroll up and down the page to view the content. Blogsites are more interactive, allowing visitors to leave comments and perform other actions via widgets on the Blogsite. It is the interactive nature of the Blogsite that makes it most different from our Flash templates. * Sitezadmin to allow you to edit all colors, font, design elements, background, and more with NO CODING required! The Flash sites are more traditional websites, designed of optional use with a Splash Page, and include both public and private proofing galleries (proofing galleries are only available at the Premium service level), as well as static text pages, built by the client, that display within the normal screen view, with no scrolling up and down (except in the case of a text page, where you may have to scroll WITHIN the page, but not the page itself). * Sitezadmin to allow you to edit all colors, design elements, pictures, text, background, and more with NO CODING required! Please contact sales@portfoliositez.com with additional questions!